Sushi Tetsu has been opened for more than 3 years. Why it has taken me this long to come here begs the question. Perhaps it is because it is almost impossible to get a seat at this little restaurant with only 7 seats around the sushi counter – the restaurant only takes bookings on two days a month and you you need a fair bit of luck to snag a seat here especially if you have a particular date and time in mind. This makes booking a table at the Fat Duck seem a piece of cake. In my case, I happened to be following their twitter feed where from time to time they will announce last-minute cancellations. It so happen I was on twitter when they announced a slot for lunch had opened up. I had the day off. Decisions, decisions! My fat fingers couldn’t dial fast enough before I was greeted by Harumi (the chef’s wife) who confirmed that the seat was still available. Five minutes later, and having given them my credit card details, I had snagged a seat at one of London’s most coveted tables. 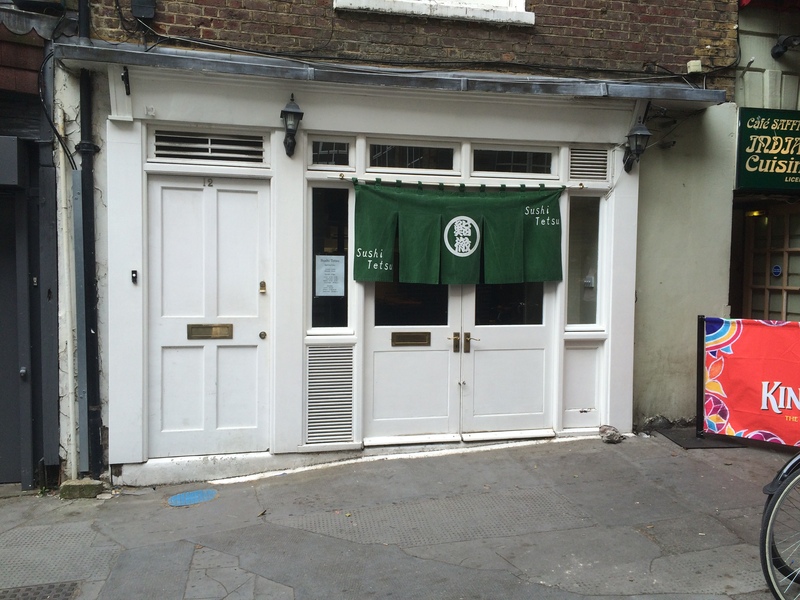 In true Japanese style, the restaurant is tucked away in a small alley behind Modern Pantry. In keeping with an authentic sushi-ya you will find in Japan, the premise is tiny with a small sitting area, in case you need to wait for your guests to arrive, and the sushi counter itself. All diners will get an excellent view of chef Toru Takahashi skilfully slicing each and every piece of fish and carefully crafting individual pieces of sushi. He runs the restaurant with his wife and an assistant. As you probably have guessed the restaurant only serves sushi and sashimi. No tempura, ramen, karaage or teppanyaki in sight. If you are a vegetarian or do not eat raw fish you should go somewhere else. They have a small menu available detailing individual items but customers are encouraged to pre-order one of three Omakase menus priced at £60 or £80 when they make a booking. I naturally chose the Sushi only Omakase which includes 12 individual nigiris and a hand roll. At the end of the meal, I could not resist ordering a few extras. The first thing to talk about when discussing sushi is of course the vinegar flavoured rice or shari. Chef Takahashi carefully prepares the rice (he uses two different types of rice) to ensure it is served warm at blood temperature. He opts to go easy on the amount of vinegar – some itamae (sushi masters) choose to go heavy with the vinegar which I find detracts from the subtle flavour of some fish. To each their own I suppose, but I prefer the approach they adopt here. Chef Takahashi sources his fish locally. From Billingsgate market to be exact. His wife tells me that in England, it is very difficult to source from Tsukiji market due to various import restrictions and as such he works very close with a local supplier for all his fish. He uses a separate supplier for his Tuna which comes from Spain. 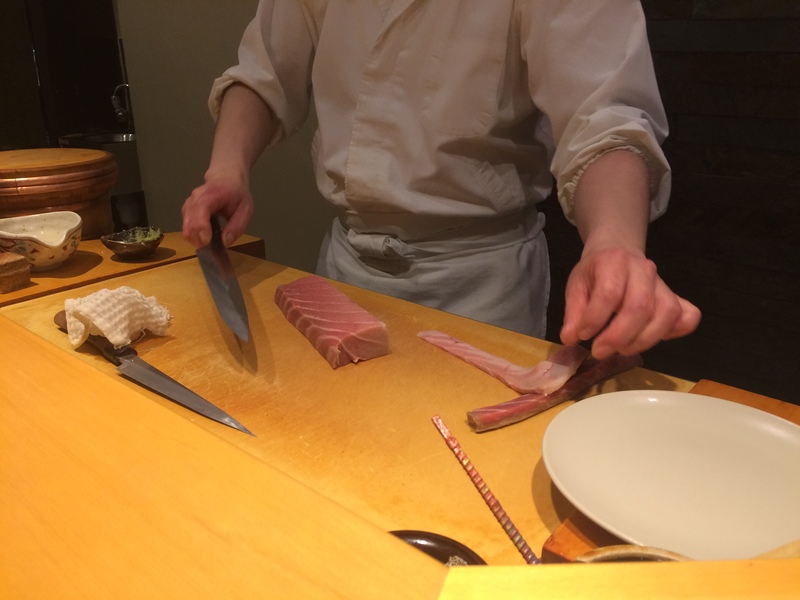 Over the course of your meal here, you will see his expert knife skills in action as he carefully slices and prepares each piece of fish for your sushi. He spends an hour every day sharpening his knife! Each piece of sushi is served complete, ready to be eaten – you do not need to dip it into any additional soy. Any condiments be it wasabi, sansho pepper or soy would have been applied by the chef prior to the sushi being served to the customer. Speaking of wasabi, they use the real deal here, flown in from Japan and grated on shark skin. Throughout my 2 hour lunch here, I got to enjoy some of the finest sushi. However, Chef Takahashi is not shy to apply the use of the blow torch to certain fishes. Take for example the Otoro (Fattiest Tuna) – a gentle application of blow torch sears the fatty tuna and brings out all the lovely flavours of the fish. Trying the seared version side by side with the au naturel version (ordered separately), I much preferred the torched version. The meal concludes with the traditional serving of Tamago (Japanese sweet Omelette) a true test of a chef’s skill. 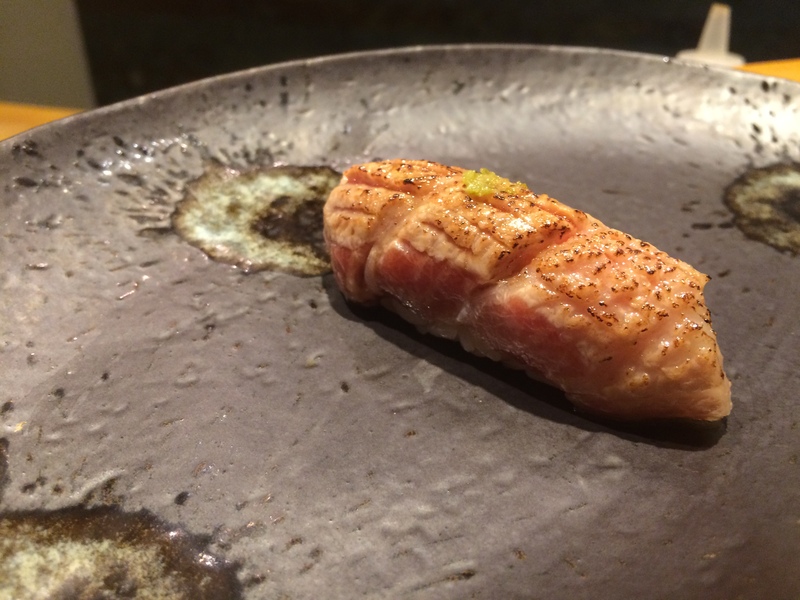 I swear Chef Takahashi has injected air into his because it is unbelievably light. Unfortunately, 2 hours fly by all too quickly and as much as I wanted the meal to continue forever, my stomach space is finite. Eventually, it was time to pay up and head home. Chef Takahashi and his wife were exceptionally great hosts which made the experience even more memorable. If you ever get the chance to eat here, you’d be silly not to do so. Hello G. Thank you for the article ! I’m, like you, trying to book a table at the restaurant, but as living in Paris, I think it’s just… impossible ! But with your help, I could see exactly what’s served.